As part of the Halwa Puri Aur Cholay Ka Salan ~ A Pakistani Nashta , I made the Sooji Ka Halwa. 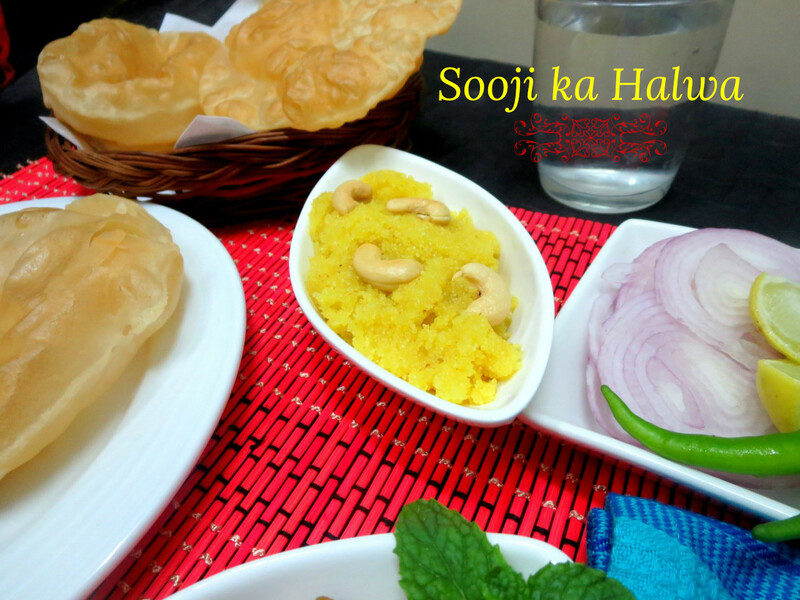 Again even though I have so many versions of Sooji Halwa on the blog, just cooking it differently or using different measurement, I was surprised the taste can vary so much. So this method has become my favorite noe. 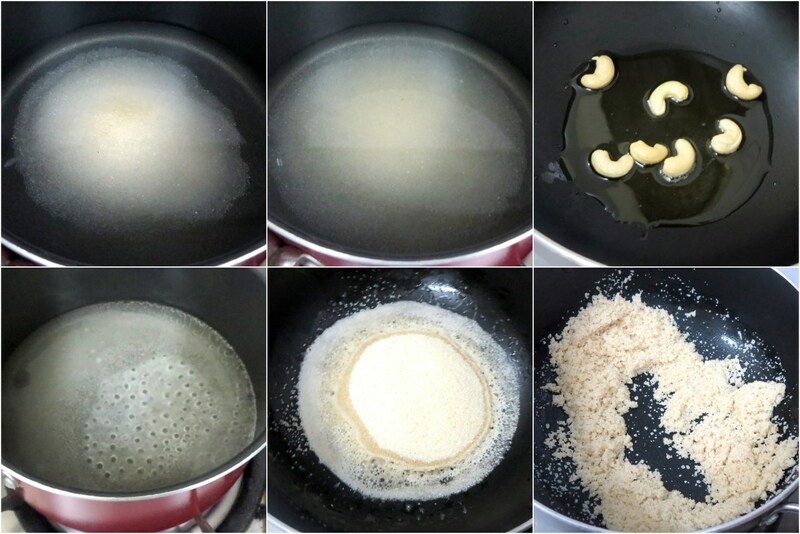 I have previously used this sugar syrup method too, somehow I think I did’t cook like a syrup and added before it turned. So the results may not have like what I got this time. Though I had wanted to make everything for the breakfast, knowing that hubby dear will not be in for breakfast, I decided to make it for dinner. This surely served so well as dessert too. With quarterly exams going on for the kids, the mornings seem to be jobless for me. I just have to pack their snack box which seem to be carrying some savory snacks or biscuits. Else it will be a case of headless chicken running around. All of a sudden I find that mornings seem to be very relaxed. Then for a week, it will be a total hungama as they will sleep in and I won’t be able to make anything else. When the school again reopens, the routine follows. Is it only me, or you also feel this year slipping away too quickly for our comfort? I can’t believe we are in the final quarter already! Well as long as we make the best of the time, create memorable times for our kids, I guess its okay! In a deep pan, combine water and sugar to boil. When it gets to a boil, continue boiling till the sugar gets dissolved. 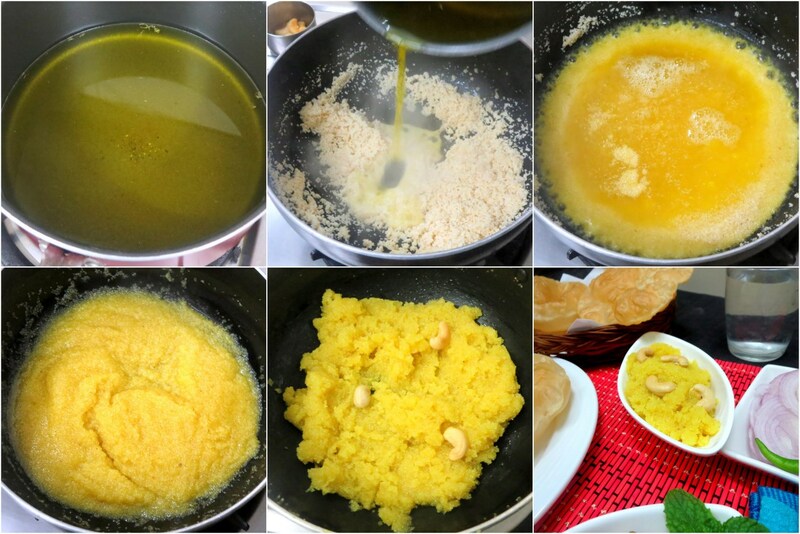 In a pan add ghee and roast semolina on slow fire, when you start getting the roasted aroma, remove from the fire. Add food color and flavor to the sugar syrup, Mix well. Add this syrup to the roasted semolina and cook by watch for 3 MINUTES. Switch off the gas and cover the halwa. I just had lunch but still craving for this tempting halwa.Lovely.. Since I made sheera couple of weeks ago, it has become my go to sweet for quick dessert. Halwa looks good and it does make a good dessert. 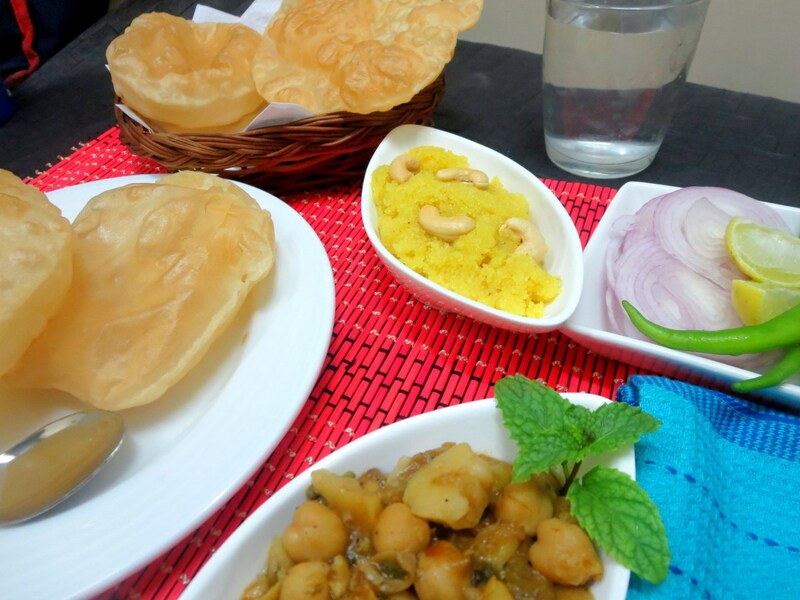 This halwa is a keeper recipe and I wish you added the kewra essence , it takes it to a different level ! Beautifully made . My mom in law also makes delicious Sheera.The pictures are very nice. Arranged beautifully! same story here, it is eid holidays for 5 days, so mornings are soo relaxed, then after a week, it will be same headless chicken thingy! My all time favorite.Love your version.Very yummy. I did not realise your kids have a full day school Valli. Ok then it must be very hectic. 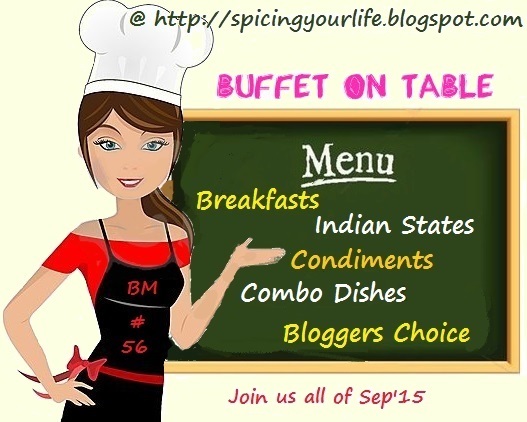 Next time I am in Chennai I want this combo I will love to eat with people who eat everything cooked.